Katherine Matilda "Tilda" Swinton (born 5 November 1960) is a British actress, performance artist, model, and fashion muse, known for her roles in independent and Hollywood films. She is the recipient of three BAFTA Awards, one BIFA Award, one Volpi Cup and an Academy Award for Best Supporting Actress and has received three nominations for a Golden Globe Award. She began her career in films directed by Derek Jarman, starting with Caravaggio (1986), followed by The Last of England (1988) and War Requiem (1989). Swinton won the Volpi Cup for Best Actress at the Venice Film Festival for her performance as Isabella of France in Edward II (1991). She next starred in Sally Potter's Orlando (1992), and was nominated for the European Film Award for Best Actress. 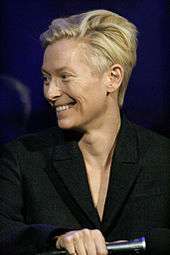 Swinton was nominated for a Golden Globe Award for her performance in The Deep End (2001). She followed this with appearances in Vanilla Sky (2001), Adaptation (2002), Young Adam (2003), and Constantine (2005). She then starred in the crime drama Julia (2008), I Am Love (2009), and the psychological thriller We Need to Talk About Kevin (2011). Swinton later starred in the dark romantic fantasy drama, Only Lovers Left Alive (2014). She is also known for her performances as the White Witch in the Chronicles of Narnia series (2005–10). Swinton won the Academy Award for Best Supporting Actress and the BAFTA Award for Best Actress in a Supporting Role for her performance as lawyer Karen Crowder in Michael Clayton (2007). Her other film appearances include Female Perversions (1996), Tim Roth's The War Zone (1998), The Beach (2000), Teknolust (2002), Thumbsucker (2005), Stephanie Daley (2006), The Curious Case of Benjamin Button (2008), Burn After Reading (2008), Moonrise Kingdom (2012), Snowpiercer (2013), The Grand Budapest Hotel (2014), Trainwreck (2015), A Bigger Splash (2015) and Doctor Strange (2016). In 2005, Swinton was given the Richard Harris Award by the British Independent Film Awards in recognition of her contributions to the British film industry. In 2013 she was given a special tribute by the Museum of Modern Art. Swinton was born in London, the daughter of Judith Balfour (née Killen; 1929–2012) and Sir John Swinton. She has three brothers. Her father is a retired major general in the British Army, and was Lord Lieutenant of Berwickshire from 1989 to 2000. Her mother was Australian. Her paternal great-grandfather was a Scottish politician and herald, George Swinton, and her maternal great-great-grandfather was the Scottish botanist John Hutton Balfour. The Swinton family is an ancient Anglo-Scots family that can trace its lineage to the Middle Ages. The family is one of only three families (along with the Ardens and the Berkeleys) that can trace their unbroken land ownership and lineage to before the Norman Conquest. Swinton attended three independent schools: Queen's Gate School in London, the West Heath Girls' School and also Fettes College for a brief period. West Heath was an expensive boarding school where she was a classmate and friend of Princess Diana. As an adult, Swinton has spoken out against boarding schools, stating that West Heath was "a very lonely and isolating environment" and that she thinks boarding schools "are a very cruel setting in which to grow up and I don’t feel children benefit from that type of education. Children need their parents and the love parents can provide." Swinton went to volunteer in Kenya during a break from college with an educational charity called Project Trust. In 1983, Swinton graduated from New Hall (now known as Murray Edwards College) at the University of Cambridge with a degree in Social and Political Sciences. While at Cambridge, she joined the Communist Party; she later joined the Scottish Socialist Party. It was in college that Swinton began performing on stage. Swinton joined the Royal Shakespeare Company in 1984, appearing in Measure for Measure. She also worked with the Traverse Theatre in Edinburgh, starring in Mann ist Mann by Manfred Karge in 1987. On television, she appeared as Julia in the 1986 mini-series Zastrozzi: A Romance based on the Gothic novel by Percy Bysshe Shelley. Her first film was Caravaggio in 1986, directed by Derek Jarman. She went on to star in several Jarman films, including The Last of England (1987), War Requiem (1989) opposite Laurence Olivier, and Edward II (1991), for which she won the Volpi Cup for Best Actress at the 1991 Venice Film Festival. Swinton also played the title role in Orlando, Sally Potter's film version of the novel by Virginia Woolf. The part allowed Swinton to explore matters of gender presentation onscreen which reflected her lifelong interest in androgynous style. Swinton later reflected on the role in an interview accompanied by a striking photoshoot. "People talk about androgyny in all sorts of dull ways," said Swinton, noting that the recent rerelease of Orlando had her thinking again about its pliancy. She referred to 1920s French artist and playful gender-bender Claude Cahun: "Cahun looked at the limitlessness of an androgynous gesture, which I’ve always been interested in." Recent years have seen Swinton move towards more mainstream projects, including the leading role in the American film The Deep End (2001), in which she played the mother of a gay son she suspects of killing his boyfriend. For this performance she was nominated for a Golden Globe Award. She appeared as a supporting character in the films The Beach (2000), featuring Leonardo DiCaprio, Vanilla Sky (2001) with Tom Cruise and, as the archangel Gabriel in Constantine (2005) with Keanu Reeves. Swinton has also appeared in the British films The Statement (2003) and Young Adam (2003). In 2005, Swinton performed as the White Witch Jadis, in the film version of The Chronicles of Narnia: The Lion, the Witch and the Wardrobe, and as Audrey Cobb in the Mike Mills film adaptation of the novel Thumbsucker. Swinton later had cameos in Narnia's sequels, The Chronicles of Narnia: Prince Caspian and The Chronicles of Narnia: The Voyage of the Dawn Treader. In 2007, Swinton's performance as Karen Crowder in Michael Clayton earned her both a BAFTA award for Best Supporting Actress as well as the Oscar for Best Performance by an Actress in a Supporting Role at the 2008 80th Academy Awards, the film's sole win. Swinton next appeared in the 2008 Coen Brothers film, Burn After Reading. Swinton said of the film, in which she plays opposite George Clooney, "I don’t know if it will make anybody else laugh, but it really made us laugh while making it." She was cast for the role of Elizabeth Abbott in The Curious Case of Benjamin Button, alongside Brad Pitt. She had a starring role as the titular character in Erick Zonca's Julia, which premiered at the 2008 Berlin International Film Festival and later saw a limited U.S. release in May 2009. She starred in the film adaptation of the novel We Need to Talk about Kevin, released in October 2011. She portrayed the mother of the title character, a teenage boy who commits a high school massacre. In 2012, she was cast in Jim Jarmusch's Only Lovers Left Alive, a vampire film which began filming in June 2012. She was joined by John Hurt and Tom Hiddleston. The film premiered at the Cannes Film Festival on 23 May 2013, and was released in the US in the first half of 2014. She also played Mason in the 2014 sci-fi film Snowpiercer. In 2015, she starred in Luca Guadagnino's thriller A Bigger Splash, opposite Matthias Schoenaerts and Ralph Fiennes. Swinton also portrayed the Ancient One in the 2016 Marvel Cinematic Universe film, Doctor Strange. On 23 November 2015, Luca Guadagnino revealed during an interview to Italian website Daruma View that Swinton will be in his remake of Suspiria. Shooting begins in August 2016, to be released in 2017. In 1995, with producer and friend Joanna Scanlan, Swinton developed a performance/installation live art piece in the Serpentine Gallery, London, where she was on display to the public for a week, asleep or apparently so, in a glass case, as a piece of performance art. The piece is sometimes wrongly credited to Cornelia Parker, whom Swinton invited to collaborate for the installation in London. The performance, entitled The Maybe, was repeated in 1996 at the Museo Barracco in Rome and in 2013 at the Museum of Modern Art in New York. She has collaborated with the fashion designers Viktor & Rolf. She was the focus of their One Woman Show 2003, in which they made all the models look like copies of Swinton, and she read a poem (of her own) that included the line, "There is only one you. Only one". In 2013, Swinton was named as one of the fifty best-dressed over 50 by The Guardian, and often appears on International Best Dressed Lists. In May 2013 it was announced that Swinton would be the face of the Chanel Pre-Fall Paris-Edinbourg collection. This collection was inspired by Scottish traditional fashion and fabrics. In 1988, she was a member of the jury at the 38th Berlin International Film Festival. In 1993, she was a member of the jury at the 18th Moscow International Film Festival. In 1996, she appeared in the music video for Orbital's "The Box". In August 2006, she opened the new Screen Academy Scotland production centre in Edinburgh. In July 2008, she founded the film festival Ballerina Ballroom Cinema Of Dreams. The event took place in a ballroom in Nairn on Scotland's Moray Firth in August. Swinton has collaborated with artist Patrick Wolf on his 2009 album The Bachelor, contributing four spoken word pieces. In 2009, Swinton and Mark Cousins embarked on a project where they mounted a 33.5-tonne portable cinema on a large truck, hauling it manually through the Scottish Highlands, creating a travelling independent film festival. The project was featured prominently in a documentary called Cinema is Everywhere. The festival was repeated again in 2011. In 2012, Swinton appeared in Doug Aitken's SONG 1, an outdoor video installation created for the Hirshhorn Museum and Sculpture Garden in Washington D.C. In November of the same year, she and Sandro Kopp made cameo appearances in episode 6 of the BBC comedy Getting On. In February 2013, she played the part of David Bowie's wife in the promotional video for his song, "The Stars (Are Out Tonight)", directed by Floria Sigismondi. In July 2013, Swinton appeared photographed in front of Moscow's Kremlin holding a rainbow flag in support of the country's LGBT community, reportedly releasing a statement: "In solidarity. From Russia with love." Swinton and her former partner John Byrne have two children, twins Honor and Xavier Swinton Byrne (born 6 October 1997). She lives in Nairn, overlooking the Moray Firth in the Highland region of Scotland, with her children and her partner Sandro Kopp, a German-New Zealand painter. ↑ "Young Adam scores Bafta success". ↑ "The BAFTA Los Angeles Britannia Awards in 2008". ↑ "Tilda Swinton Honored by NYC's Museum of Modern Art Film Gala on Her 53rd Birthday". The Hollywood Reporter. 6 November 2013. Retrieved 28 October 2015. ↑ "Tilda Swinton Biography". Biography. Retrieved 11 August 2014. 1 2 Hattenstone, Simon (22 November 2008). "Winner takes it all". The Guardian. London. Retrieved 23 May 2012. ↑ "Tilda Swinton Biography". Tiscali.co.uk. Retrieved 2011-02-11. ↑ Judith Grey (22 May 2013). "At 52, Actress Tilda Swinton Is The New Face Of Chanel". Seattle P-I; Hearst Seattle Media. Retrieved 11 August 2014. ↑ "Tilda Swinton, one of our most unique actors, talks to Gaby Wood". London: The Guardian. 9 October 2005. Retrieved 2011-02-11. ↑ Burke, Sir Bernard. A Genealogical & Heraldic Dictionary of the Landed Gentry of Great Britain & Ireland, 18th Edition, Volume 1. ↑ Dunlop, Alan (11 June 2009). "Fettes College Preparatory School, Edinburgh, by Page\Park Architects". London: Architects Journal. Retrieved 18 June 2012. ↑ Schager, Nick (2 Dec 2016). "Tilda Swinton vs. Harry Potter: Hogwarts Might Not Be All It's Cracked Up to Be". Yahoo. Retrieved 3 December 2016. ↑ James Mottram (2 April 2010). "Tilda Swinton: 'I was expected to marry a duke!'". The Independent. Retrieved 14 February 2016. ↑ Gray, Sadie (2005-11-27). "Profile Tilda Swinton White Witch takes a red and pink ride to stardom". The Times. London. ↑ "Measure for Measure". AHDS. Retrieved 26 February 2015. ↑ "Tilda Swinton". Leiron Reviews. 2009. ↑ "Man to Man Park theatre". Culture Whisper. Retrieved 26 February 2015. ↑ Diane Solway (August 2011). "Planet Tilda". W magazine. Retrieved 11 August 2014. ↑ Ebert, Roger (2007-10-05). "Michael Clayton". Chicago Sun-Times. Retrieved 2007-12-15. ↑ "Hollywood Foreign Press Association 2008 Golden Globe Awards". Hollywood Foreign Press Association. 2007-12-13. Archived from the original on 2007-12-14. Retrieved 2007-12-15. ↑ "Winners Announced" (Press release). BAFTA. 2008-02-10. Retrieved 2008-02-10. ↑ Solway, Diane (September 2008). "Social Studies". W magazine. Retrieved 11 August 2014. ↑ Longworth, Karina (2010-01-06). "Why the Academy Will Ignore Nicolas Cage and Tilda Swinton's Oscar-worthy Turns". Vanity Fair. Retrieved 2010-01-06. ↑ Rogers, Nathaniel (2010-02-03). "Oscar Noms: Ten Talking Points". TribecaFilm.com. Retrieved 2010-02-03. ↑ Robinson, Anna (2009-12-22). "Tilda Swinton Best Performer of 2009 – indieWIRE Poll". Alt Film Guide. Retrieved 2009-12-22. ↑ Editors (2009-03-18). "Producer Says Tilda Swinton to Star in "Kevin," Adaptation of Lionel Shriver Novel". New York Times Blogs. Retrieved 2009-03-21. ↑ Macnab, Geoffrey (16 May 2011). "Swinton, Fassbender and Wasikowska line up for Jarmusch's vampire story". ScreenDaily. Retrieved 16 May 2011. ↑ Radish, Christina (June 2014). "Tilda Swinton Talks SNOWPIERCER, Creating Her Outrageous Character, Playing a Character Originally Written as a Man & the Film's International Production". Collider.com. Retrieved 11 August 2014. ↑ "First still of "A Bigger Splash": Matthias Schoenaerts, Tilda Swinton, Dakota Johnson and Ralph Fiennes". imgur.com. 27 July 2015. Retrieved 28 July 2015. ↑ Sampson, Mike (2015-07-14). "Tilda Swinton Explains Why She's "Really, Really, Really Excited" to Star in Marvel's 'Doctor Strange'". ScreenCrush. Retrieved 2015-07-26. ↑ "A Bigger Splash – Abbiamo incontrato il regista Luca Guadagnino" (in Italian). darumaview.it. 23 November 2015. Retrieved 5 December 2015. ↑ "Suspiria, Luca Guadagnino: "Dakota Johnson e Tilda Swinton sono nel cast"" (in Italian). velvetcinema.it. 23 November 2015. Retrieved 5 December 2015. ↑ "Tilda Swinton sleeps in glass box for surprise performance piece at Museum of Modern Art". Daily News. New York. 2013-03-23. Retrieved 2013-03-23. ↑ Elle 'the muses' Tilda Swinton Archived 20 February 2008 at the Wayback Machine. ↑ Cartner-Morley, Jess; Mirren, Helen; Huffington, Arianna; Amos, Valerie (28 March 2013). "The 50 best-dressed over 50s". The Guardian. London. ↑ "Berlinale: 1988 Juries". berlinale.de. Retrieved 2011-03-04. ↑ "18th Moscow International Film Festival (1993)". MIFF. Retrieved 2013-03-09. ↑ "Sir Sean Connery Named Patron of Screen Academy Scotland". 2006-11-02. Archived from the original on 29 September 2007. Retrieved 2008-04-25. ↑ "Ballerina Ballroom". Spanglefish.com. 2008-08-23. Retrieved 2011-02-11. ↑ "'Tilda Swinton to appear on Wolf's new album". Kwamecorp.com. 2009-01-12. Retrieved 2011-02-11. ↑ "Entertainment | Actress Swinton hauls cinema". BBC News. 2009-08-04. Retrieved 2012-02-02. ↑ "Tilda Swinton: From Russia, With Pride". Out.com. 5 July 2013. Retrieved 11 August 2014. ↑ Graeme Thomson (19 March 2011). "theartsdesk Q&A: Artist/Dramatist John Byrne". Retrieved 18 June 2013. ↑ "Swinton happy to make Narnia cameo". United Press International Entertainment News. 19 May 2008. ↑ "BBC - Derek, directed by Isaac Julien and starring Tilda Swinton, is a film that looks back at Jarman's life. - Derek Jarman". BBC. Retrieved 12 March 2016. ↑ "A Bigger Splash" Watch new movie trailer starring Tilda Swinton, Ralph Fiennes & Matthias Schoenaerts". Pulse.com.gh. David Mawuli. Retrieved 11 February 2016. Wikimedia Commons has media related to Tilda Swinton.